This entry was posted in 2012 Election, Barack Obama, Energy and tagged 2012 election, bailouts, Banksters, Barack Obama, Congress, Davis Besse, Dennis Kucinich, FirstEnergy, House of Representatives, John Boehner, John Nichols, Marcy Kaptur, Norm Dicks, NRC, Nuclear Power, Nuclear Regulatory Commission, OH-10, OH-9, Ohio, primary, redistricting by Gregg Levine. Bookmark the permalink. I heard once that Einstein is purported to have said (in relation to what I don’t know)”only two things are infinite, the Universe and Human Stupidity, and I’m not so sure about the Universe”! …It will be a sad day for us all when Rep Kucinich departs congress. He was a beacon of light in a dark place. He is one of the few who fights against the “absolute Stupidity” of using radioactive elements for ANY use….bombs or electricity…. 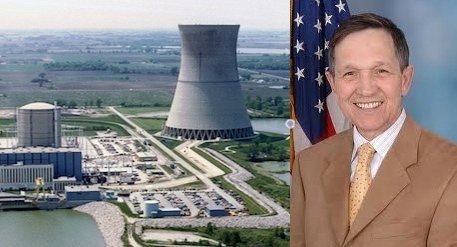 EK–I hope Rep. Kucinich finds a a venue for his energy and voice, and I hope he finds one that still gives him the attention his positions deserve. I was going to add that I hope that he can avoid being marginalized once he has left the House, but it is not like he wasn’t marginalized while he was in it.